Next month, the increasingly popular Deep Learning Summit is returning to London along with the fourth global AI Assistants Summit. This two track event will bring together cross-industry experts in AI and deep learning to share their latest research advancements. At previous editions of the Deep Learning Summit, we’ve heard from experts from DeepMind, IBM Watson, NVIDIA, Tractable, Aeon, Babylon Health, and many more. At the Summit last year discussing his work in deep learning was research scientist at DeepMind, Oriol Vinyals. 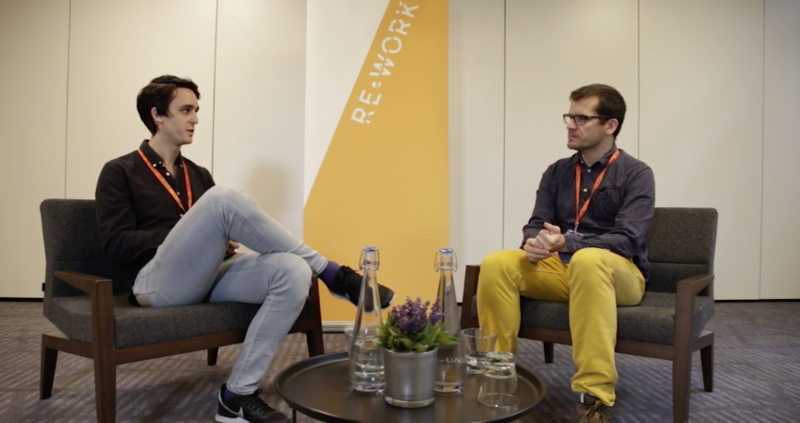 Named as one of 35 innovators under 35 last year, Oriol discussed his work in generative models and how these models have been extensively used to test our current capabilities and, in some cases, they help guiding our intuitions towards better architectures. After his presentation, Oriol sat down with Nathan Benaich, to chat about his current work, and you can watch his interview here. This year DeepMind will be returning to the summit where we will hear from Irina Higgins, and her colleague Jörg Bornschien, who will be discussing early visual concept learning with unsupervised deep learning. The automated discovery of these visual concepts from raw image data is a major challenge in AI research, and Irina will explore the unsupervised approach for learning disentangled representations of the underlying factors of variation. She will discuss how they are drawing on inspiration from neuroscience and show how this can be achieved in an unsupervised generative model. This can be done by applying the same learning pressures as have been suggested to act in the ventral visual stream in the brain. As well as hearing from large companies, we welcome thriving startups to the event each year. Having seen companies such as Graphcore present and go on to complete successful rounds of fundraising, showcasing breakthrough technology is a core part of our summits. Speaking about their machine learning based music composition platform, Jukedeck, founder and CEO Ed Newton-Rex explained how there are several misconceptions of AI, the principal being that ‘Machine Learning’ and ‘Artificial Intelligence’ are not the same thing. Machine Learning is one approach to Artificial Intelligence, but there are many more.’ You can hear more from Ed and catch a preview of his presentation here. Confirmed speakers for the Deep Learning Summit next month also include Eli David, Deep Instinct, Ankur Handa, OpenAI, Andrew Tulloch, Facebook, Antonia Creswell, Imperial College, and many more. You can view the speaker linkup here. @Jdotwatts: Well said. Indeed #reworkDL was superb. Congratulations! @nikitaljohnson thanks for inviting me to speak, I feel honored. @katramadosi: At the #reworkDL #deeplearning summit I kept getting blown away by the countless possibilities DL offers. It is becoming huge beyond belief. @viktortnk: Was incredibly useful to hear what people are working on and areas they do research. You guys did an incredible job organising this event. I was impressed with the level and number of people who came. As conversational assistants become more prevalent as a tool to assist with real-world issues, the automation of natural language conversations becomes increasingly important. These assistants aim to provide support, information and solutions for customers and in order to have an emotional connection with the user the agents need to understand the users’ motivational underpinnings and ‘thus provide empathic, context-sensitive dialogue.’ This year on the AI Assistants track we will hear from Anne Hsu, who will share her research in psychologically aware AI at University of London. Also exploring conversational user interfaces is Alex Fawcett of Sage who is working on the platform ‘Pegg’, which allows startups and small business owners, and anyone else who hates admin, to manage their business through their favourite messaging apps. Last year, Sheenu Chawla, CEO of Crya.ai spoke about the potential of chatbots being developed to find more suitable candidates in recruitment than their human counterparts. She spoke about how using the principles of intelligent virtual assistants, machine learning and natural language processing to disrupt the existing recruitment industry that has been inefficient, costly and laborious for ages. Her current work is providing employers a new approach to recruitment by helping them hire exactly the candidates they are looking for and assisting them to automate their hiring workflow. Watch videos from the most recent edition, and learn more about AI assistants in advance of the Summit next month, here. @advizzo: Great gender balance throughout the event which is refreshing and inspiring to see. Attendees are free to attend sessions across both tracks, providing a diverse agenda to explore. Do you know a startup working in AI who would benefit from attending or showcasing their technology at the Deep Learning Summit and AI Assistant Summit, London? Recommend them here to win a complimentary pass to the event.